Dennis (Denny) Carl Hohbein, 78 of Rogersville, MO formerly of Beatrice, passed away on January 17, 2019. Born November 7, 1940 in Lexington, NE to Carl and Laura (Deerk) Hohbein. He married Eileen Rose Diedrichs on June 13, 1964 at St. John Lutheran Church in Beatrice, NE. and lived in their home at 1720 Hoyt St. in Beatrice, NE for 43-years, where they raised their daughters, Laura and Angela. After retiring in 2006, they moved to Rogersville, MO to be closer to their daughters and their families. 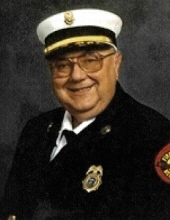 Denny started his fire service career in 1965 as a member of the Beatrice Fire Department, where he advanced over the years to City Fire Inspector. In 1975 he began his career with the Nebraska State Fire Marshal's office as a Deputy, three years later he was promoted to Deputy State Fire Marshal of District A, a position he held for 17 years. For several years the District A office was located on the grounds of Beatrice State Developmental Center, where he also served on the volunteer fire department. In 1995 he became the safety coordinator at Beatrice State Developmental Center. In 2000 Denny returned to the Nebraska State Fire Marshal's office as the Assistant State Fire Marshal. In 2003 he was appointed as the Nebraska State Fire Marshal, where he served until his retirement in December 2006. Denny enjoyed outdoor activities with family and friends, especially fishing, boating, and hunting. Some of his favorite memories were of boating/skiing trips on Table Rock Lake and exploring mountain jeep trails in Colorado with Rose and their daughters, fishing trips on the Buffalo River with his sons-in-law and grandsons, and fishing and hunting trips with many friends and family over the years. He and Rose enjoyed riding motorcycles together, taking Laura and Angie on "supper rides" when they were younger, riding from Beatrice to nearby towns to have dinner. He enjoyed assembling model cars, black powder rifles and pistols. During his time in Beatrice, Denny was a member of St. Paul Lutheran Church (1940-1960) and St. John Lutheran Church (1960-2007), where he served on various committees and church council. He and Rose joined Messiah Lutheran Church in Springfield, MO when they moved to Missouri in 2007, where he enjoyed worshiping and serving on church council and the Safety Committee. He is survived by his wife Rose, daughter Laura (Jason) Helmke of Rogersville, MO and their children, Amanda, Hunter, and Makayla, and Angie (Josh) Nickell of Columbia, MO and their two sons, Austin and Evan; brother-in-law Eldon John (Karen) Diedrichs of Milford, NE; sister-in-law Joyce Vanwinkle of Beatrice, NE; niece Christine Richtig and family of Puyallup, WA; and nephews, Aaron Diedrichs and family of Deltona, FL and Caleb Diedrichs of Milford, NE. Preceded in death by his parents Carl and Laura Hohbein, Aunts Agnes Witcofski, Clara and Elizabeth Deerk, Uncles Fred Witcofski, John and Albert Deerk. A celebration of Life service will be held at 10:30 A.M. on Saturday, January 26, 2019 at St. John Lutheran Church of Beatrice with Pastor Leah Lawson officiating. Interment will be in the Evergreen Home Cemetery of Beatrice. In lieu of flowers, memorial has been established to the family’s choice. A family prayer service will be held at 10:15 A.M. in the chapel of the church. Prior to the service, a visitation with family will be held at St. John's from 9:00-10:00. www.foxfuneralhome.net Fox Funeral Home in charge of arrangements. To send flowers or a remembrance gift to the family of Dennis (Denny) Carl Hohbein, please visit our Tribute Store. "Email Address" would like to share the life celebration of Dennis (Denny) Carl Hohbein. Click on the "link" to go to share a favorite memory or leave a condolence message for the family.